▲March to this year's biggest LGBTQ party! ▲ Celebrate the Pride March with this empowered and unstoppable crowd at Budapest Park. 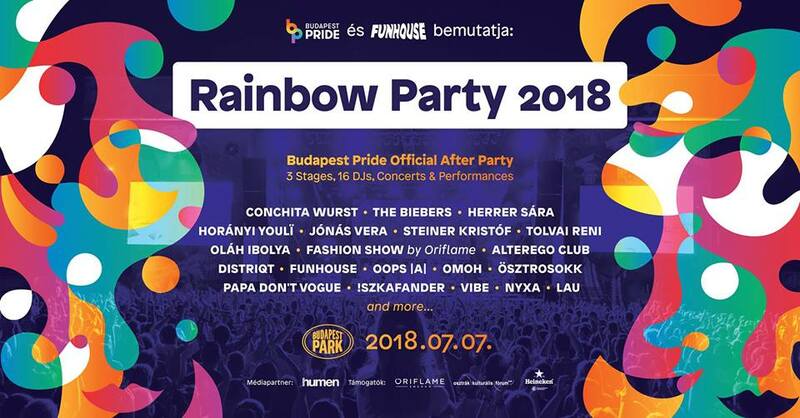 Highlights of Budapest Pride Festival are the Pride March and the afterparty, called Rainbow Party. This year we are tuned for freedom, which's firm believers we are. We persistantly believe that together we can make our dreams come true. Last year we succeeded in marching without cordons, and this year we will be celebrating at Budapest's biggest open air concert venue! 20 years ago we only could meet a secret places, we were forced to hide, and there is still a few who wishes we would be invisible. But we will never give up, we are standing up for ourselves year by year with larger and louder crowds to reach the point where we can be ourselves every day, everywhere, without fear. Instead of 10 days, this year's Budapest Pride Festival will be one month long, and we paint the whole country rainbow in collaboration with local LGBTQ organizations. Concerts, theatre festival, exhibitions, workshops, roundtable talks and numerous other programs will be held in the whole country. On 7th July Conchita Wurst, the winner of the Eurovision 2014, the ambassador of the Europride 2016, the world-famous drag artist and her band will be celebrating with us! More artists and surprises to be announced soon! Concerts are usually held between 7pm and 10pm. After the concerts parties are hed at multiple venues. ▲ We only can be held responsible for tickets purchased from our official partners: tixa.hu, Ticketportal, Simple mobile app. ▲ Do not publish your ticket at any platforms! Tickets purchased at budapestpark.hu don't need to be printed! Access to the concert can be granted by showing the bar code or the QR code on your phone. ▲ The age limit is 18. Underage people may only enter the Park with a parent. Parental supervision cannot be substituted by: partners and siblings over 18. One parent may take responsibility for no more than 2 children in addition to their own.